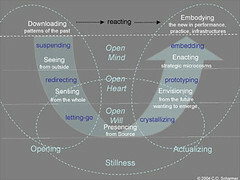 Theory U is the creation of Otto Scharmer, who is a close associate of the renowned Peter Senge. What I really like about Theory U is the emphasis on ‘letting go’ and ‘letting come’. How often do we consciously build into a process a question like ‘What do we need to let go of to really deal with this problem ?’ and then how often do we allow ourselves to pause enough and get quiet enough to really start to hear the first signs of what might just be emerging and to ‘let come’ ? The full book is 500+ pages, so I suggest you don’t go there until you’re sold on the process. The best way to get into it is to have a chat to someone who knows their way around about how it could apply in your particular context. There are a handful of people practicing Theory U in Ireland, get in touch if you’d like to know more. This is one of those things where it is really handy to have the fresh insights of someone from outside of your system. Incidentally, Peter Senge’s latest book ‘A Necessary Revolution’ is all about getting to another level. It is a deep recognition of the limits of the path we are on and of the urgency of a shift to a much more sustainable way of being. The point of mentioning this here is to underline that mainstream figures like Peter Senge, one of the leading management and leadership figures in the world, are thinking this way. When we think about ‘change’ we need to be beyond the stage of tinkering or just messing about with structures (again), we really need to be moving our thinking and actions to a different level. Theory U gives us a fine set of tools for the job.